When the harvest moon rose on the eve of the equinox and the north wind blew leaves across the grass, baskets of new crop apples began to arrive. Everyone was ready for pie. My dad used to say Jonathans make the best pies. For decades, legendary apple farmer, Frank Owen of southwest Ohio, sold me bushels of Jonathans from his orchards. Here north of Chicago this year’s first Jonathan apples came from southern Michigan. Jonathans may not be a trendy newfangled hybrid, but the snappy taste of their crisp flesh is irresistible. When it comes to pies, they can’t be beat. Gather round now, all pie lovers, and learn the old-fashioned secrets. There’s no short cut for a great apple pie, but with a little practice, “it’s as easy as pie.” No prepared crust, canned filling or frozen pie will compete with what you make yourself. Only with a homemade pie will you be assured of the best ingredients, minimal sugar and delicate spicing that lets the true fruit flavor shine through. With a food processor, making the pastry is a breeze. I always prepare more than I need for one pie and freeze the rest for the next baking. Bandaging the edge of the pie with a strip of clean cotton sheeting (buy a white sheet at the next rummage sale) guarantees that the edges won’t burn and juices won’t run over in the oven. Baking the pie the afternoon of your dinner will fill your house with fragrant anticipation. Be sure to make enough to have apple pie with a slice of aged cheddar for breakfast the next morning just like Washington and Jefferson. Now is the time for all good cooks to bake the all-American apple pie. *Buy kettle-rendered white lard from a meat counter; avoid shelf-stable lard modified with preservatives. Good lard makes tender, flaky crust and is worth seeking out. Note: The most accurate way to measure the flour and fat for pastry is with a scale, and the proper fat/flour ratio is vital. Once you start to bake using a scale, you’ll wonder how you ever managed without one. To make pastry in a processor, place flour, sugar and salt in work bowl. Process just to combine. Slice over the cold butter and lard; process on and off three or four times until the butter is flaked into small pea-sized pieces. With the processor running, steadily pour the ice water in through the feed tube and continue to process until pastry rolls into a ball. Remove from work bowl, rock into a thick log. Wrap and chill at least an hour. To make pastry by hand, whisk the flour, sugar and salt in a large shallow bowl. Slice in the cold butter and lard and rub the fat into the flour using floured fingertips or a pastry blender. When the butter is in floury flakes, drizzle over the ice water a little at a time, forking it evenly into the crumbly mix. Bring the dough together into a ball with both hands and shape into a log. Wrap and chill. Choose a 9- or 10-inch glass pie dish with a lip so you can check the bottom for doneness at the end of the baking. Have ready a 3-by-50-inch strip of clean cotton sheeting to wrap the pastry edges. In a large bowl combine ½ cup sugar, cornstarch, salt, cinnamon, nutmeg. Mix in peeled and sliced apples (7–8 cups) and vanilla. Keeping the pastry lightly dusted with flour, gently roll it into a circle 1/8-inch thick and larger than the pie dish. Fold the rolled dough in half and then in quarters forming a triangle. Place the point of the pastry in the center of the pie dish and unfold the pastry smoothing it into the bottom edges of the dish. Sprinkle a generous teaspoon of flour over the bottom of the pastry and pour in the sliced, sugared apples mounding them in the center. Slice butter over the apples. Trim any pastry overhanging the pie dish lip. 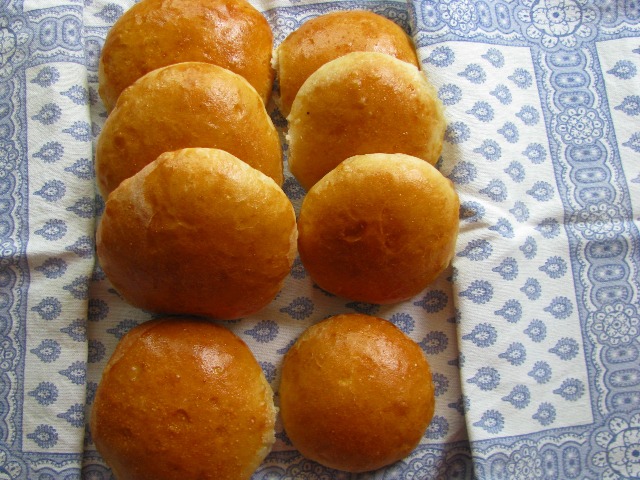 Roll the second patty of pastry in the same manner. Fold the dough in quarters and cut three small diagonal slashes on each edge near the center (see photo for result). Brush the pastry on the pie dish lip with water, unfold the top crust over the apples and moistened pastry edges. Gently press crust edges to seal. Use a scissors to trim the top crust overhang ½ inch below the edge. Fold the trimmed overhang under the bottom crust on the lip and crimp decoratively. Brush the top of the pie with cream or milk and sprinkle generously with 2 tablespoons sugar. Rinse the cotton sheeting strip and squeeze out excess water. Bandage the edge of the pie letting the strip cover the top edge of pastry on the pie dish lip while the other half clings underneath. The damp cotton will adhere to itself at the end. Place pie in the center of the preheated oven and reduce heat to 375º. Bake for 40–60 minutes or until piecrust is golden both on the top and the bottom. If the top browns too fast, cover with a sheet of brown paper or foil. If the bottom browns before the top, place the pie dish on a heavy sheet pan. 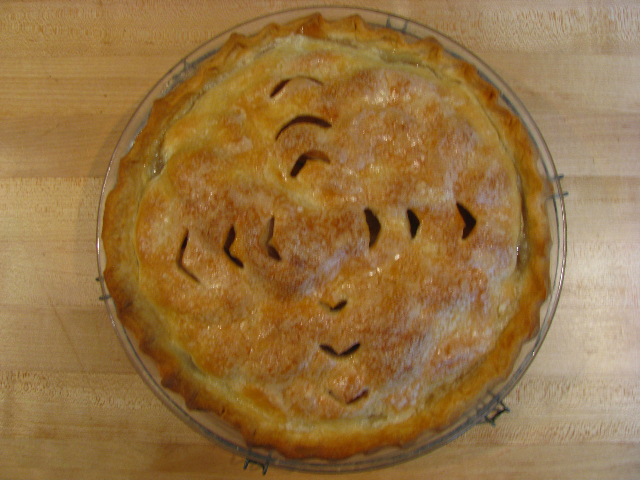 The pie is done when the crust is golden and the apples test tender when pierced with a toothpick. Remove to a wire cooling rack. Unwrap bandage while pastry is warm. Serves 6–8. Rice came to the table only as pudding when we lived in Potato Land. A little spaghetti drifted in on the sidelines, but rice seemed exotic, difficult to cook and not a dish to bring sighs of joy to the round oak family table. To keep things simple, start with two types of rice: white and brown. For me that means Basmati and round organic brown rice. A rice cooker makes the preparation child’s play, but a heavy pot with a tight-fitting cover will suffice. Lately as I’ve been trying to incorporate more brown rice while quieting the “We want white” plaint, I’ve been blending the two. Since brown rice takes much longer to cook, I keep a bowl of chilled cooked brown rice and add it to white rice dishes halfway through the cooking cycle. When leftovers seem to be taking over the fridge, make a rice and vegetable centerpiece for your meal and surround it with the remainders of roast chicken, spare sausage, baked eggplant, or flaked fish. 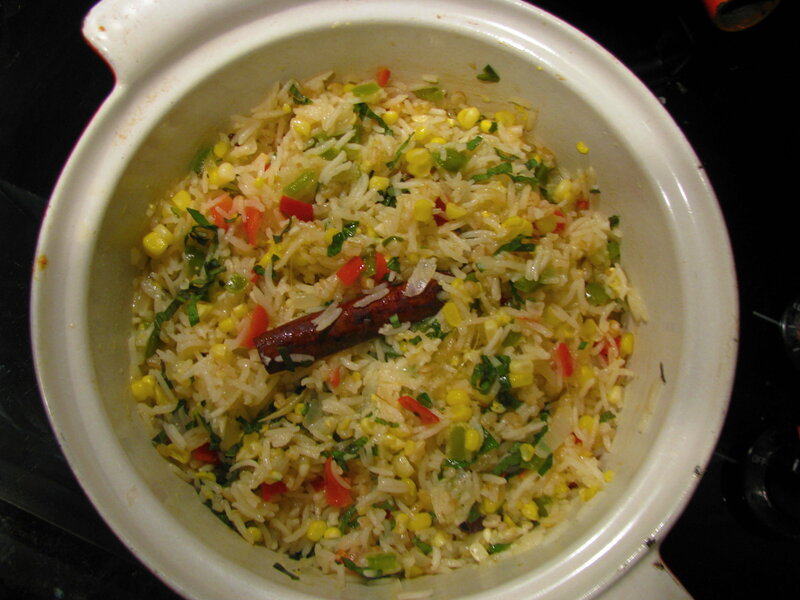 This rice mixture, based on a pilaf model, can fit any season and can include almost any assortment of veg on hand. Here I’m using peppers and corn, but it works with carrots, celery and frozen peas; mushrooms and spinach; tomatoes and cooked lentils; roasted poblanos and Swiss chard. The possibilities are endless: once you begin with your base of sautéed onion, you’ll find comfort in the rice cookery that connects you to the global community. Please note that the cinnamon stick used in rice should be Ceylon Cinnamon and not Cassia. Ceylon Cinnamon, usually known as Canela, is available wherever Latin products are sold. If “apple pie” cinnamon stick or Cassia is all you can get, use only a matchstick-size piece to keep the flavor in balance. In a heavy saucepan with tight-fitting lid warm the cinnamon in olive oil. Add chopped onion and pepper; sauté until limp. Add garlic, chile, herbs and sauté until fragrant. Add Basmati rice, salt and sauté two minutes longer. Add water. (Use minimal amount if vegetables are juicy.) Cover and simmer 5 min. Uncover; add corn and brown rice. Recover and cook another 5 min. Turn off heat and allow to stand 5 min. Uncover, fluff with fork, taste for seasonings and garnish sprinkling of fresh parsley. Serves 4. Near my grade school in town, my Lapp grandparents had a tidy lawn, catalpa trees and spirea bushes in front of their house; a T-bar clothesline, vegetable garden, roses and a white fence in back. In the kitchen a fold-down ironing board hid on one wall, a pull-out under-counter breadboard added space, and windows all around the table let in plenty of eastern light. Summertime found canning kettles on the stove, jelly bags dripping purple juice and the grinder spitting out onions, peppers and tomatoes for chili sauce. The sauce with bits of vegetable, canned in pint jars, came out as ketchup later in the season when venison burgers sputtered on the patio grill waiting to fill soft steamed buns. 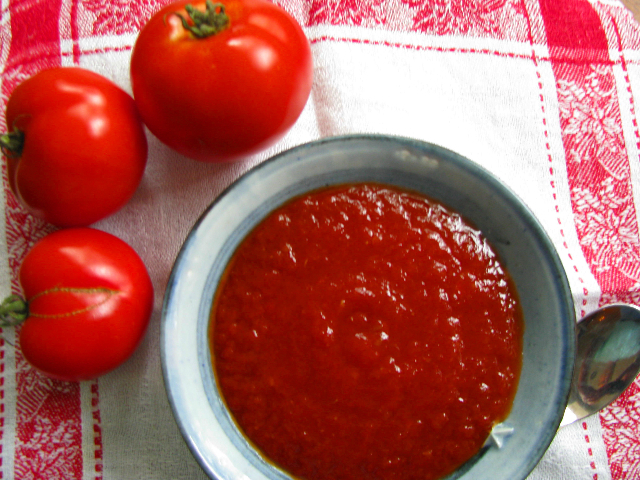 This homemade, less sweet and intensely flavored tomato condiment always kept me away from the Heinz variety. Throughout the years whenever I simmer a heap of late summer tomatoes into fragrant ketchup, my mind wanders back to the Lapp kitchen. Now I’m the grandmother. Although I haven’t yet convinced my grandchildren that homemade is better than Heinz, I’m working on it. Ketchup came to us from the Far East when seafaring traders brought back a fermented fishy sauce that took different guises with the addition of sugar, vinegar and finally our New World tomatoes. Indian meals always include savory chutneys, Koreans serve kimchis, Germans use mustards and Americans are lost without ketchup. Next time a batch of late harvest tomatoes is about to get away from you, try some homemade ketchup and experience extraordinary flavor. 1. Core and quarter tomatoes. Crush in large saucepan; bring to a simmer and cook until pulpy. Pass soft pulp through a food mill or colander. Discard skins and seeds. Measure 6–7 cups seedless tomato puree. 3. Simmer slowly until reduced and thickened. Stir from time to time to prevent burning. Note: In winter make ketchup using one (strained) 28 oz. can of crushed tomatoes in tomato puree. You are currently browsing the Mary Jo's Kitchen blog archives for September, 2010.